A very popular edible fungus, Cantharellus cibarius is known as the Girole in France and simply as Chanterelle in Britain. 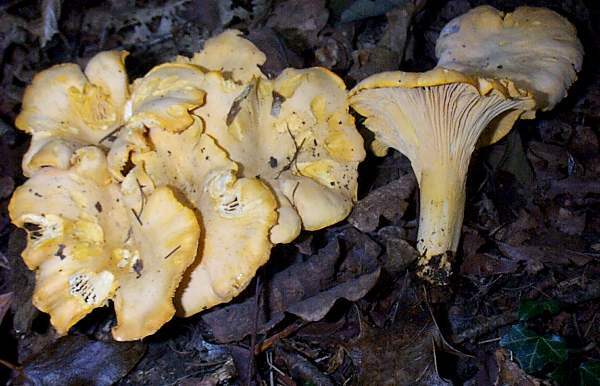 Occasional large groups of Chanterelles occur in mixed woodland, notably under birch trees and often beside paths. Chanterelles are world famous not only because they are so good to eat but also because of their appearance in so many countries. In Europe they occur from Scandinavia to the Mediterranean. Frequent but localised in Britain and Ireland, Cantharellus cibarius is found throughout mainland Europe. In Britain we have seen Chanterelles as early as the first week in June, although most years there are none to be seen until late June or early July. In 2011 there were still plenty of fresh young fruitbodies in mid October as far north as the Scotland's Caledonian Forest, although in more typical seasons these summer gourmet mushrooms are over by the end of September - at least unless you are able to travel to Southern Europe. Chanterelles are found also in many parts of North America, the season varying greatly both in timing and in duration depending on location. 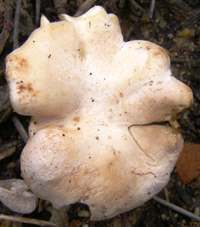 The unusual specimen pictured above has an area of hymenium (spore-producing surface) on the top of the cap as well as below. Such abberations are common in the world of fungi, and particularly in the genera Agaricus and Lepista; however, the Chanterelle shown here, found in the grounds of Haliotis, a sustainably managed valley in the Alantejo region of Portugal, was one of many Cantharellus cibarius fruitbodies which displayed this remarkable feature in an area of about 100 square metres around a large Cork Oak tree. I conclude that all of the Chanterelles in that area were either fruiting from the same mycelium or from a few mycelia cloned by natural disturbance from a common ancestor with this trait. 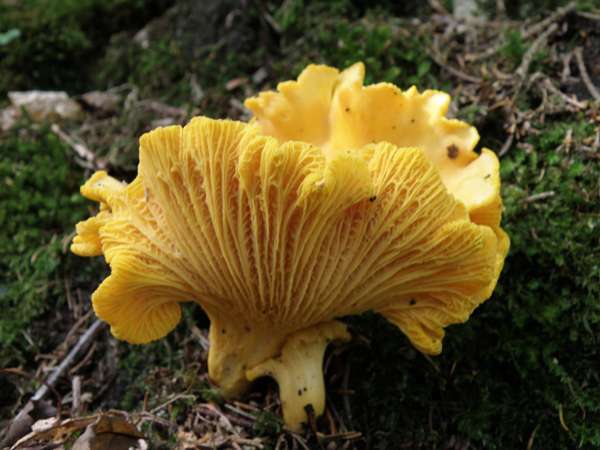 Cantharellus cibarius, the Chanterelle mushroom, which is the type species of the genus Cantharellus and the best known of all of the Cantharellales, was named and described in 1821 by the great Swedish mycologist Elias Magnus Fries, and as there have been no changes in its genus the original scientific binomial name holds to this day. The specific epithet cibarius comes from the Latin 'cibus' meaning food (or rations) - clear evidence that Carl Linnaeus knew his edibles! The usually funnel-shaped cap, of diameter up to 10cm, has a wavy irregular margin. 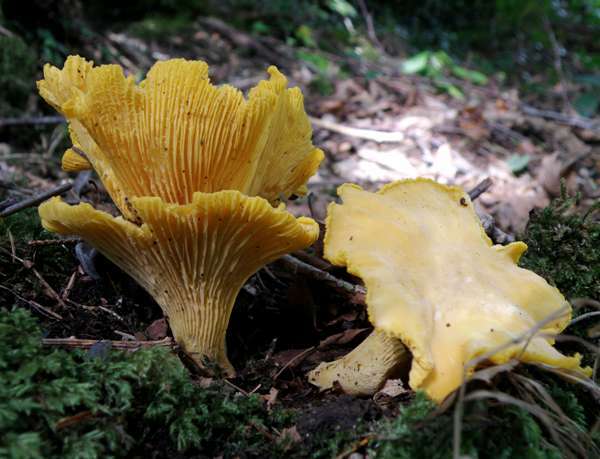 Colour varies from light yellow to deep egg-yolk yellow, but sometimes a fine white bloom masks the background colour (as in the exceptionally pale specimen shown on the left)..
Not strictly gills at all, the wrinkled veins on the underside of the cap distinguish the Golden (as some people call it) Chanterelle from lookalikes such as Hygrophoropsis aurantiaca, the False Chanterelle. 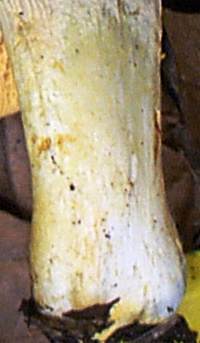 The veins are very thick and decurrent, extending well down the stem; they are straight near to the stem but forked and more sinuous towards the edge of the cap. The stem of Cantharellus cibarius is the same colour as or somewhat paler than the cap; often no more than 2cm long and merging into the cap. When growing in clumps, as is often the case, the stems of Chanterelles are often curved and occasionally joined together near the base. 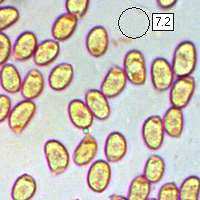 Ellipsoidal, smooth, 7-11 x 4-6µm; inamyloid; hyaline (translucent and glass-like) in KOH. Pale yellow to creamy white, sometimes with a slight pinkish tinge. Faint odour of apricots; taste (uncooked) not distinctive. This ectomycorrhizal species is most frequently found in deciduous forests with oak, chestnut or hazel, but Common Chanterelles also occur under conifers and occasionally on roadside verges beneath deciduous hedgerows. 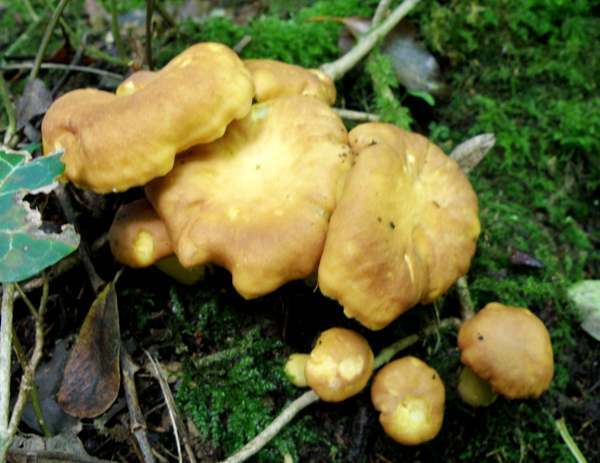 Chanterelles show a preference for acid soils. June to October - even into November in mild autumns - in Britain and Ireland; often from October right through to the following March in southern Europe. Sometimes confused with Hygrophoropsis aurantiaca, the False Chanterelle, which is a bright orange gilled boletoid fungus. The rich fruity aroma (like apricots, many people say) and pleasant texture of cooked Chanterelles are one of Nature's culinary delights, and these edible mushrooms are not difficult to spot if you look in the right kinds of places. 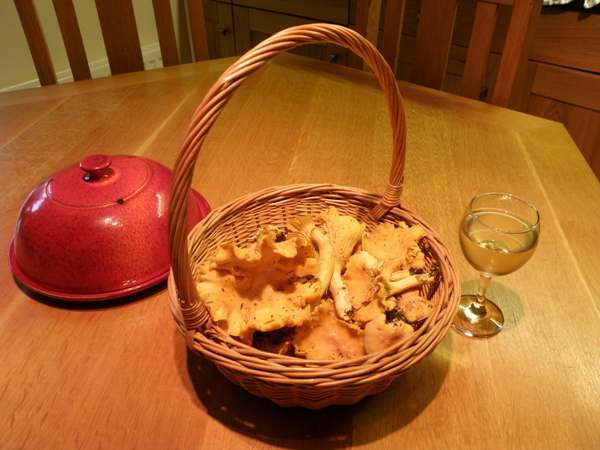 For these reasons the Chanterelle is one of our 'Magnificent Seven' and there are recipes for taking advantage of such marvelous mushrooms in Chapter 10 of Pat O'Reilly's new book Fascinated by Fungi... If you have never tried cooked Chanterelles you are in for a real treat. 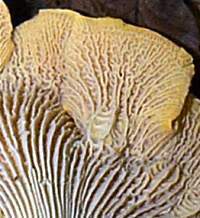 What's more, because these woodland fungi have wrinkles rather than gills on the fertile (lower) surface of their curly and often contorted caps, getting to be competent at identifying Cantharellus cibarius with complete certainty is not at all difficult. Above: all you really need in the way of raw ingredients for a fine Chanterelle supper. In the south of France Giroles can be gathered until Christmas unless the winter is particularly harsh, while in the Algarve region of Portugal the Chanterelles don't really get going until late November and we have been able to find them right through the winter until the weather gets too hot for fungi at the end of March. Many of the world's great chefs favour Chanterelle mushrooms over all others (even including Morels), because they have not only a wonderful flavour but also a tender, non-crumbling texture. In Germany, Chanterelles are commonly known as 'Pfifferling', and they are highly prized. In Sweden, where in summer and autumn the forest are scoured by far more fungus foragers than they are by mycologists, these golden funnels are known as 'Vanlig Kantarell' (meaning Common Chanterelle) or simply 'Kantarell'. Italy, too, has caught Chanterelle fever. There these golden nuggets are known as 'gallinaccio', and many fine Italian dishes use Cantharellus cibarius is a crucial ingredient for which no substitute is considered acceptable. The Chanterelle is a very good all-round edible mushroom. It can be used in rissotto dishes and omelettes, and it certainly has enough flavour to make tasty soups or sauces to be served with chicken or fish dishes. Try our Salmon and Chanterelles main course recipe; you will love it!